Biotech has been crushing the broader markets for several years running at this point. However, this amazing run might be about to come to a screeching halt, making now a good time to short biotech. 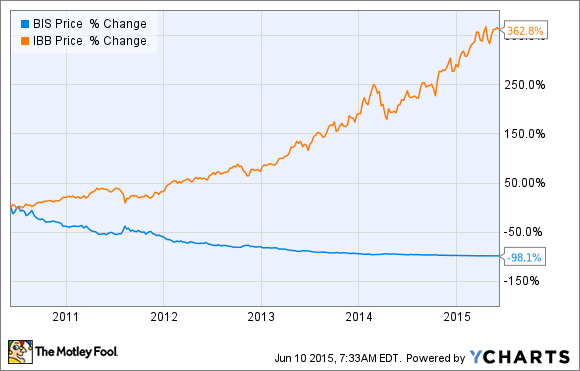 Biotech and biopharma have had an incredible run over the past few years. And like many investors, I've been able to crush the broader markets simply by buying and holding top names in the industry like AbbVie (NYSE:ABBV), Gilead Sciences (NASDAQ:GILD), and Isis Pharmaceuticals (NASDAQ:IONS). An odd thought, however, keeps popping up in my mind as I look over my rocket-fueled biotech portfolio these days. Namely, why aren't stocks like Gilead doing even better? Although this leading biotech stock is up a stately 21% so far this year, I've become so accustomed to rapid-fire increases in share price with this company that such an eye-popping gain is no longer good enough. A quick look at the headlines surrounding this stock suggests that I'm far from alone in holding this ridiculous notion. The sheer silliness of this expectation, along with fact that it's become pervasive throughout the investing community of late, led me to a frightening realization. Namely, the biotech blowout party looks like it's likely about to come to an abrupt and painful end. And although timing the market perfectly is impossible, I believe now might be a good time to cut back on long positions and, dare I say it, start shorting biotech. Though there are bound to be many single companies that will continue to deliver strong returns, here's a look at my three major reasons for shorting this currently high-flying industry. One of the main reasons biotech has exploded higher is because the industry has been undergoing an innovation boom, leading to the advent of breakthrough therapies for hepatitis C, HIV, high cholesterol, and even cancer. What most investors aren't aware of, though, is that this golden age of biotech and biopharma took decades to achieve. Science progresses in fits and starts. Cancer immunotherapy, for instance, has been grabbing headlines left, right, and center lately, fueled by the stunning clinical performance of Bristol-Myers Squibb (NYSE:BMY) and Merck's (NYSE:MRK) PD-1 inhibitors in advanced melanoma, non-small cell lung cancer, and other hard-to-treat malignancies. The twist to the story, however, is that immunotherapy as a field has been around for decades and is only now bearing fruit. Reason No. 2: Drug prices could crater in the U.S.
Pharmaceuticals products in the U.S. have long enjoyed premium pricing structures. But the super-high demand and mind-boggling price tags for new game-changing drugs like Gilead's Sovaldi for hepatitis C is putting the healthcare system under an immense amount of pressure. Public and private payers have even gone as far as saying the burden on the healthcare system from these breakthrough drugs is simply unsustainable. Dr. Steve Miller of Express Scripts (NASDAQ:ESRX) thus decided to pit AbbVie's Viekira Pak against Sovaldi as a means to bring prices down. And he was stunningly successful, negotiating a discount on Viekira Pak in exchange for exclusivity on the pharmacy benefit manager's preferred formulary drug program. The scary part for investors and drug companies is that cancer drugs tend to have little or no effect at all in most patients. So, a performance-based reimbursement system has the potential to absolutely crush the cash flows of cancer specialists and biotech bellwethers like Celgene Corp. (NASDAQ:CELG). Given that what goes up must come down -- even high-flying biotechs -- it stands to reason that the biotech surge can't go on forever. And in light of the dark clouds currently forming around the industry, I think that time is nigh. 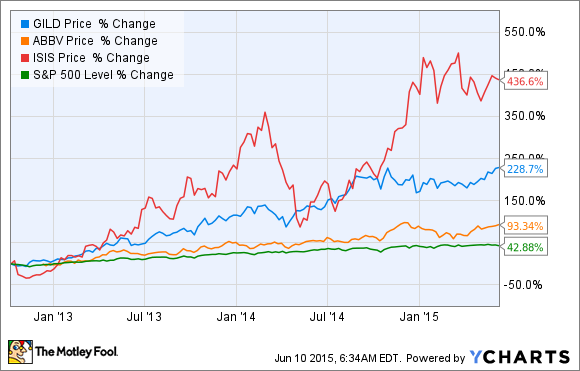 Biotech has been one of the best-performing industries for a while now. But the confluence of a slowing rate of innovation in the broad sense (entirely new classes of drugs being discovered), and pricing pressures emanating from the payer side of the healthcare equation, have the potential to weigh this group down for a long time to come. The headwinds for Gilead already appear to be taking their toll on the biotech's share price. After all, the market is no longer willing to pay a premium for its earnings, and other key biotechs like Celgene are starting to experience a similar level of disinterest from the Street. And although the market is nothing if not unpredictable, I personally think we're looking at the start of an emerging trend reversal in biotech, making now a good time to get short.